Eight of 11 families of Iranian Jews missing since the 90s are given official confirmation of their murders. Eight of 11 families of Iranian Jews missing since the 90s were told Thursday evening at the Center for Intelligence Heritage that their relatives were murdered on their way to Israel. The men were among 11 Iranian Jews whose disappearances in 1994 and 1997 have been cited by the U.S. State Department as pointing to possible anti-Semitic persecution. They had been traveling in four separate groups, that tried to escape Iran at different times. David Meidan, who was a Mossad official for 35 years until his retirement two years ago, gave the news to the relatives Thursday. 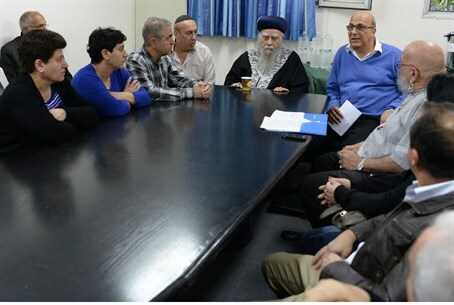 The meeting was also attended by former Chief Rabbi Eliyahu Bakshi Doron. The families of the eight had pressed the government to seek information about their fate as part of its past prisoner swaps with Iranian-backed Lebanese terror militia Hezbollah. In a statement, Prime Minister Binyamin Netanyahu's office said that the Mossad had investigated and "received from a reliable source, privy to the details, information that these Jews were captured and murdered while escaping (Iran)." The statement did not say who carried out the killings.